Golden grass is a rare, durable fibre found in Swamps amd Marshes in northen and eastern O.. This beautiful box is made with a technique of entwining sabai grass with fresh jute threads&nb..
Eco-Friendly Palm Leaf Product is a specialized hand work in producing various kinds of Palm Leaf&nb.. This simple yet elegant decorative piece, made of Sabai Grass, is hand woven intricately into r..
Eco-Friendly Palm Leaf Product is a specialized hand work in producing various kinds of Palm Leaf products. We have been keeping the managing thought of "high quality, innovation, unity enterprising". We supply eco-friendly and environmental protection palm leaf products. 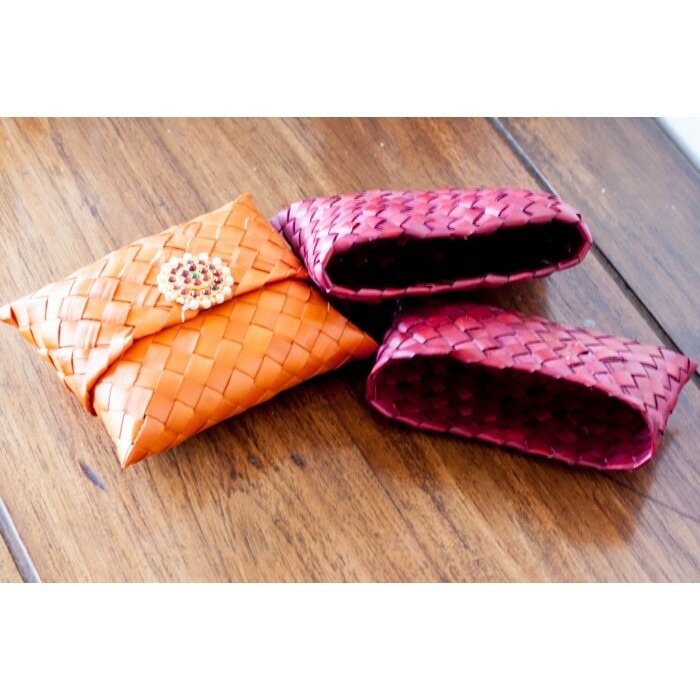 It is easily carriable and for a great handicraft feel.Money pouch to give Shagun with a south motif on top . Extremely ethnic and beautiful design from Rista Handicrafts. Copyright © 2014, ristahandicrafts.com. All Rights Reserved .